For the best lawn care service, you need to know what your soil needs and more importantly what it doesn't. 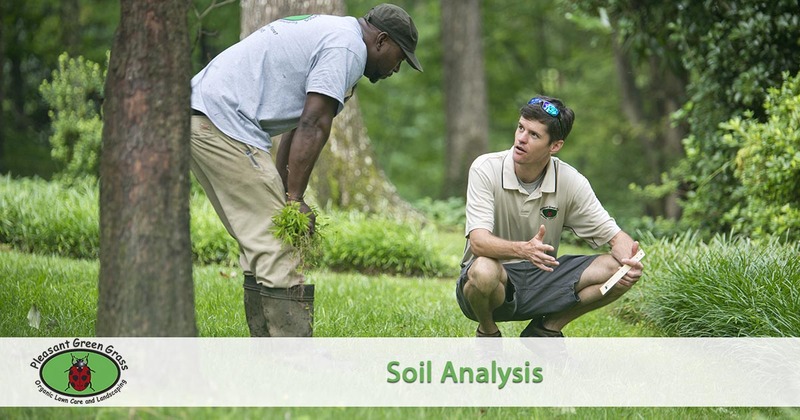 Here at Pleasant Green Grass we offer soil analysis services to help you determine the best course of action with your lawn to get the results you want. We recommend an initial soil test to all of our customers so that we can identify specific areas that your lawn may be lacking in nutrients and help us determine which organic lawn treatments are best for your lawn. Soil samples are taken and sent to the NC Department of Agriculture where they are tested for pH and nutrient and mineral content. After the soil analysis results are received we identify what soil amendments (gypsum and lime) are needed to promote healthy grass growth. We recommend a soil test follow-up every three years so that we can make certain that more amendments are not needed. The main areas that we focus on after we receive test results are: pH, Calcium to Magnesium Ratio and the Cation Exchange Capacity. pH: Soil acidity or alkalinity affects the health of the lawn by influencing the availability of nutrients for uptake by the plant. Some nutrients won’t dissolve easily and be available to the plants if the pH isn’t right. Below pH 6.0, some elements like nitrogen, potassium and phosphorous, are less available. Limestone is an alkaline material that regulates the soil acidity. Major Benefits of Lime: Lime is a valuable soil amendment that helps plants and lawns flourish by raising soil pH. A low soil pH, or acidic soil, is often the underlying problem when it comes to many common lawn and garden problems. Adding lime to soil, has many benefits. Liming improves the quality of the soil so that grass can reap all the benefits of a healthy soil environment. At a neutral pH, existing soil nutrients are unlocked, and readily available for plant uptake. Neutral soil pH allows microbes and worms to prosper, organic matter to break down, and soil to truly become the living environment it desires to be. In addition, fertilizer is more effective at a neutral pH. When acidic soil is corrected, lawns are greener, stronger, use less water, and are more able to resist diseases. Major Benefits of Gypsum: Gypsum is a great source of Calcium. Calcium is essential for most nutrients to be absorbed by plants roots. One of gypsum’s main advantages is its ability to reduce aluminum toxicity, which often accompanies soil acidity, particularly in subsoil. Gypsum helps improve soil structure. Flocculation, or aggregation, is needed to give favorable soil structure for root growth and air and water movement. Soluble calcium enhances soil aggregation and porosity to improve water infiltration. The high clay content of our North Carolina Piedmont soils allow the soil to easily compact. Compaction reduces airflow and water flow and encourages weed growth. Adding gypsum helps disrupt clay particles essentially aerating the soil on a microbial level. Lime and Gypsum treatments do not work quickly but they do work! Both Lime and Gypsum break down slowly in the soil, so it takes a while to work. Limestone improves soil structure by stimulating biological activity in the soil. This helps form aggregates, reduces compaction and improves water retention. The Calcium to Magnesium Ratio is important. We try to obtain a 10:1 calcium to magnesium ratio. This has been show to help reduce weed growth and increase overall soil health. It’s quite normal for soils in our area to be deficient in calcium so gypsum is often recommended. It can take multiple gypsum applications to achieve that 10:1 ratio. We also look at the Cation Exchange Capacity. This is the soil’s ability to hold onto nutrients. We like to see a reading of 13 or greater. If your results show anything below 13 we will recommend more aggressive soil amendments. Your Cation Exchange Capacity will improve over time as you continue using organic products (for things like organic fertilization & weed control) that promote microbial activity. Tired of guessing what your yard needs to thrive? Give Pleasant Green Grass a call and request a soil analysis. We offer free quotes and will schedule your service right away.